Virtual Private Network or VPN technology provides a secure online connection to users. Here, when you are on a public internet connection, VPN will help you join the private network through a secure “tunnel” between your system and the network. This security mechanism helps you avoid data breach or data alteration by cybercriminals. Here, you can find consumer VPN services that help individual users to work online privately (using home or public settings) and business-related solutions that is helpful for employees to easily and securely connect to the corporate network remotely. Further these VPN connections are managed by custom software or generic third-party software. Set up a VPN in Windows: Though setting up a VPN for Windows 10, 8 or 7 system isn’t that rigid still you need to know basics of it in detail for easy process. Here, we have discussed how to set up a VPN in Windows in detail. First, if you are using VPN for your work or at the office, then you need to look for VPN app or VPN settings that are used on your office’s intranet site. You can also coordinate with your IT people to know it. Second, if you are setting VPN for personal work then you can look for Microsoft Store or third-party websites to find best VPN app to set the VPN service. Here, you can visit VPN service’s website to check whether the VPN services you are going to use are listed there or not. To start the process, go to Start menu > Settings > Network & Internet > VPN. Here, click on “Add a VPN Connection” option. Alternatively, you can search “VPN” in the search box and select “Change Virtual Private Networks (VPN)” option and tap on “Add a VPN Connection” option on the open window. Once you click on “Add a VPN Connection option, it will ask you to provide a VPN Provider name. Click on this option and select Windows (Built-In) from the drop-down menu. Note: Once you mention VPN Provider name, it will enable other features including VPN Type, Type-of-Sign-in Info, username and password. Next is to mention Connection Name. That should be a friendly name (like My Private VPN) for your VPN connection profile. This name will display when you try to connect to the server name or address box. Now mention “Server name or address” in the given option. Here, you need to mention address for the VPN server. Under VPN Type option, you need to mention what type of VPN connection you wish to create. It requires a basic knowledge of VPN connection types including what type of VPN connection your company or VPN service is using. Here, you may find options like PPTP, L2TP, SSTP or IKEv2. Under Type of sign-in Info, you need to mention sign-in-info (credentials) that you want to use for your profile. It may include information like username & password, smart card, one-time password and certificate. Under username & password, you need to mention details in respective boxes (optional) and in case you are connecting to VPN for work then select Smart Card option. Once you have mentioned all the necessary information, click on Save button to save the settings for your VPN profile. Note: If you want to edit VPN connection information or want to make other additional settings like proxy settings then select the VPN connection and press on Advanced Options. 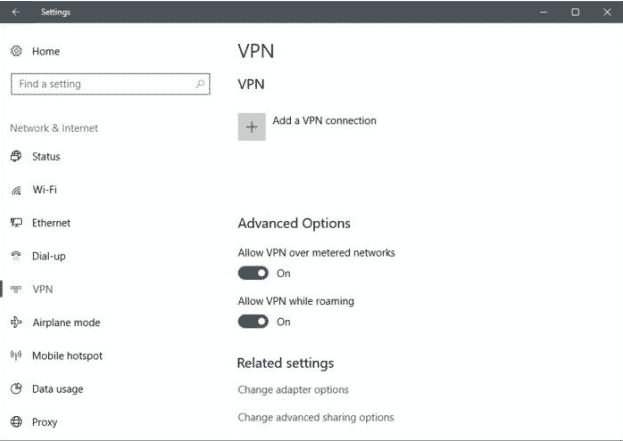 Connect to a VPN: Once you have created the VPN profile, you can easily connect to VPN for Windows on your system. To do this, follow these steps. Go to the far right corner of the Taskbar and select the Network icon. If you find the Connect button shown under the VPN connection, simply click on it. If VPN in Settings open, you may need to choose the VPN connection first and then click on Connect option. When prompted mention username & password or other necessary sign-in info. Once you are connected to VPN, the VPN connection name will show Connected just below it. 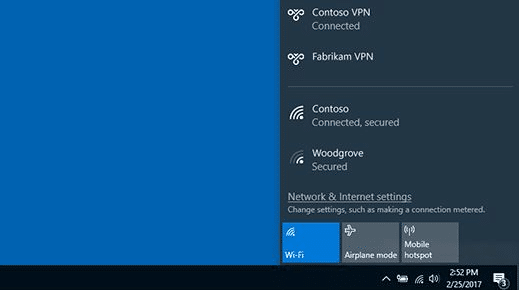 Whether you want to see if you are connected to the VPN connection while working on other things on your system, simply go to the far-right corner of the taskbar and choose Network icon. Here, see if VPN connection has displayed Connected underneath it. Conclusion: Using VPN connection helps you get secure access to the internet no matter you are working from a home, office or a coffee shop. Here, to connect to the VPN you first need to have a VPN profile for easy access to it. 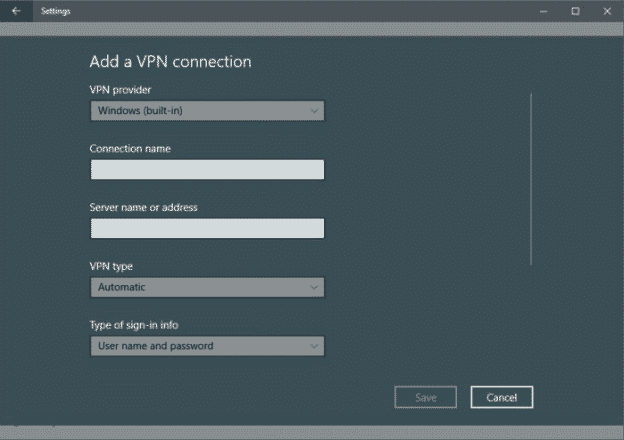 In this article, we have discussed an easy process to help you understand how to set up a VPN connection on your Windows system.